For quite a while now a few Western collectors have been searching for any kind of documentation that would settle the question of the origin of the Dr. Harvey's Blood Bitters. During a discussion at the Canyonville Bottle Show a prominent Washington State collector mentioned he had found an advertisement for the Dr. Harvey's Blood Bitters in, of all things, the 1889 Langley San Francisco City Directory. 1889? Wichmann in his book Antique Western Bitters Bottles has the Harvey's as circa 1872 and believed to be distributed by the Cassin brothers and "most likely made at the San Francisco Glass Works"
In the above advertisement Dr. Harvey's Blood Bitters is called "The Great English Remedy for Diseases of the Blood, Stomach, Liver and Kidneys" and is prepared by the Harvey Medicine Co. in London England. The A.A. Dudley & Co. are the General Agents for the Pacific Coast States and Territories. Not all of the glass factories in England, during the 19th century, were as advanced as most collectors seem to believe and the Dr. Harvey's could quite possibly have been blown in London and shipped to the west coast for distribution. Heck, the Dr. Harvey's could have even been on one of the ships that hauled all those German red whittled whiskies and beers here to the west coast. Although this is probably not a very popular idea for those collectors that consider the bottle western until some other documentation surfaces I am leaning towards the advertisement as genuine and the bottle English in nature. If anyone has documentation to the contrary I sure would like to view it. Very interesting information...while the bottle "looks" 1870s and exhibits western style embossing in some ways, it is amazing that more bitters collectors have not chimed in with their observations on this new info. There are several possibilities...one is that the bottle is indeed western in manufacture and origin, but later the brand was bought by the London concern. If this was the case, why have not more examples surfaced in England? This would explain the late 1880s time frame in the advertisement. The other option is that it is indeed English in origin from the get go...then why have not more examples turned up in the Eastern U.S.? Has there ever been any real evidence that this brand was related to the Cassin company, or is the only " evidence" the circular indentation on the reverse?Even Columbo would not make a case based solely on this. This WAS one of the western bitters on my want list, but today there are serious questions surrounding this bottle. Supposedly one was dug in Eureka, Cal. Where was the other example found? I have only seen two specimens, but it would be interesting to know of other examples or shards found, and where. The context of the finds would also date it more accurately. Dale M.
If you really look at the embossing the font has serif's. Very few bottles blown in San Francisco have serif's on the font. The R in the embossing looks to be the western curved R but on careful observation the supporting leg has a sharp end like eastern blown bottles such as the Hostetter's and G.A. Simon's. Western curved R's have a blunt end to the supporting leg. Take a look at your 1870's documented western blown bottles with curved R's and I believe you will see the difference. Sorry to confuse the issue but I meant to name the California Bitters J.G. Frisch as an example instead of the G.A. Simon's. Look at the R's on the J.G. Frisch. An intact example was found broken in downtown Sacramento by a digger/collector. This advertisement suggests that the product was bottled and sold by the manufacturer and distributed by a wholesale firm in San Francisco. I would not expect to see this product geographically anywhere else in the U.S. or otherwise unless another advertisement is found to the contrary. I only know of four of these bottles and have held each one, you’d have a hard time convincing me these are English. All were crude, sparkly, clean glass and found in California: San Francisco, Eureka, Ukiah & Merced. English glass just doesn’t come out of the ground this clean nor look like Western bottle glass. One was dug in a pit with a Millers flask and another was found by accident by a backhoe with other bottles of similar age. The glass on all four of the examples in my opinion has all the characteristics typical of early Western bottles in the 1875-85 period right down to the embossing font. I would disagree with “R” having a sharp end as on all the examples I’ve seen the R is curved & blunt much like other Western bottles. Although the date seems wrong for this bottle, many importers purchased in bulk from overseas and had their bottles blown here in the States. Evidence would suggest by where these bottles have been found, distribution was in California only. 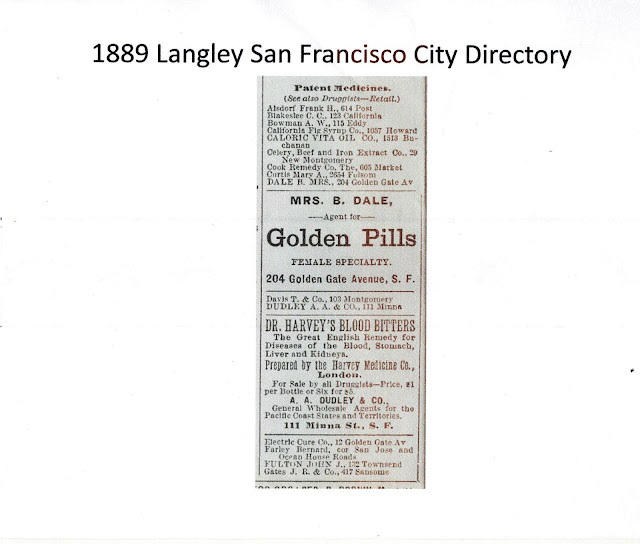 It’s likely A.A. Dudley or an earlier agent imported the goods and had bottles blown in S.F. for the market. Joe: Was this the one that sold at a Tulare bottle show in the early to mid 1980s? No,I sold mine shortly after I dug it, I believe it is the one pictured in Jeff's book with the slightly dipped lip. The one pictured in Jeff's bitters book was dug in Ukiah. Could the one I purchased at a Tulare bottle show from an older couple in the 80s be the one you sold??? The "evidence" is in the glass, embossing font and only location found. I have not had a chance to respond to this interesting dialogue re Dr. Harvey's Blood Bitters. The answer is - I am not sure if this is a Western product, but if I had to bet, I would say it is. Perhaps because, as Miller'S Extra noted, "if you own one, it is western". The focus has been on A.A. Dudley, solely because he stated he was the agent in his ad. I think that by the time Dudley had control of the product it is simply too late for him to have produced the embossed bottles. The latest date that I can confirm the curved leg "R" on western bottles is about 1883. 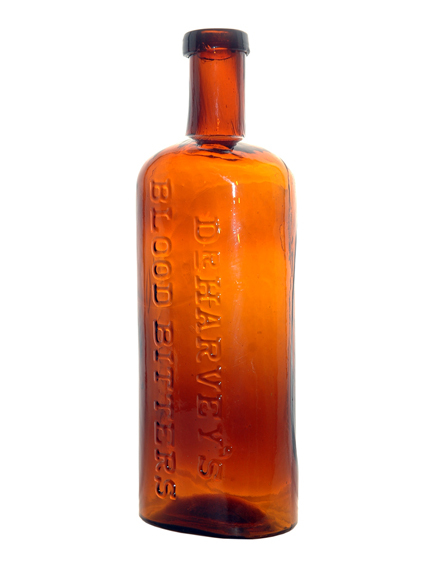 Webster Bros., of Fresno, was advertising the sale of Harvey's Blood Bitters as early as February 1885. I have not been able to find a run of Fresno papers for the early 80's but it wouldn't surprise me if ads could be found there. By the way, Avery Averill Dudley was born in 1866, so he would have been 19 years old in 1885. Just a little too young for all this unless another family member was involved in the preparation of the bitters. Dudley did go south by 1900, as he was a notary public in Stockton in that year. Then things really changed for him. His wife left him in 1901 and he remarried (2nd wife was Rafaella, born in Mexico) in Arizona the following year, where he had his only child, Clyde Arey Dudley. He also turns up in Tonapah, Nevada, and Utah and a few other places in the West that I don't recall at the moment. I find no reference to Harvey's Blood Bitters anywhere else in the world. It is possible the product started in England, but I do think the bottle is most probably of San Francisco origin. Just no solid evidence at this time. The best bet is for some of you south valley guys to hit the microfilm for Fresno newspapers during the first half of the 1880's. In the meantime I will just enjoy my bottle, which, by the way also came from Tulare County - probably dug in Visalia. I was able to find some older issues of the Fresno newspaper - it appears that the Webster Bros. did not take over the City Drug Store (as seen in the Feb. 1885 ad) until sometime in 1884 - before that it was owned and operated by J.L. Armstrong. No ads for Dr. Harvey's Blood Bitters appears in the Fresno paper before January 1885 - though there is not a complete run online where I was checking so it's possible something appears in 1884.